"It was all so wonderful, at first," says Zelda Fitzgerald about Hollywood, but the same could just as easily be said about her tumultuous relationship with F. Scott Fitzgerald. Anyone who knows much at all about the pair already knows that, but what may be missing are the details. 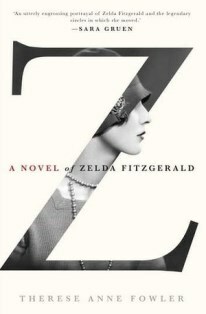 Details, albeit highly fictionalized, abound in Z: A Novel of Zelda Fitzgerald by Therese Anne Fowler. In the novel, Fowler brings the famous pair to life, along with a cast of supporting characters that is a veritable who's who of early twentieth century literature and popular culture. But Fowler doesn’t just bring them to life; she stirs controversy, too: What sort of relationship do Scott and Hemingway have, anyway? Just how culpable is Scott for driving Zelda over the edge? And how much credit does Scott deserve for the work published under his own name? As Zelda tells her story—because she’s the narrator and this is her story, not Scott’s or one with Scott’s name where hers should be—the answers are revealed. The novel is told in flashbacks, opening with Zelda hoping to return to Scott soon, trusting they've sufficiently recovered from their respective demons to be near one another again. She writes a letter to Scott, and then recounts their romance. That’s the focus of the novel, really. It is in no way an attempt to encompass all of Zelda’s life—unless one views her time with Scott as wholly defining her life—and more’s the pity. Despite the interesting life Zelda led both before and after Scott waltzed into hers, those stories are mostly left untold. An afterword does wrap up the post-Scott story tidily, but perhaps a novel that truly wanted to give Zelda a voice (as Z so clearly seems to) would have placed more focus on her entire life instead of framing her life around Scott’s. Fowler’s choice makes sense in many ways, creating a manageable focus and a tidy circular ending, but in a novel that more often than not shows Zelda fighting the shackles of society, including a husband who stifles her creatively and contributes to her eventual breakdown, she shouldn’t be forced to fight the shackles of a novel’s romantic focus, too. She was a vibrant person before she met Scott and in many ways a shattered person after, as even the novel can attest. Weighing in at a mere 366 pages of actual story in the Kindle e-book edition, the book has room for more. Zelda’s tale begins right before she meets Scott, a dashing Yankee who steals her from Montgomery and exposes her to the world and vice versa. In her youth, Zelda is a firecracker, actively fighting against social conventions of the day and earning her label as the first flapper. The novel catalogues everything from abortion to those darned corsets to homosexuality and beyond, and the progressive Zelda is leading the way for social change, only sometimes blinking an eye. Once wifehood and motherhood set in, she finds it harder to be whom she once was, and Scott seems confused. Does he want a flapper or a housewife? Can he handle a wife who can write when he sometimes can’t? Cue a sidelined Zelda, not respected enough for her art, her writing, or her dancing and fulfilling the chauvinistic prophecies about what happens to women who won’t fulfill their assigned roles in life. At times, especially when Zelda is closest to falling apart, the novel becomes aptly fragmented, sometimes even taking the form of mere lists. At times, it also gets bogged down in relationship drama and what feels like endless Gatsbyesque excess, but then how could it not? Katherine Henderson lives and writes in Zelda's hometown of Montgomery, Ala.